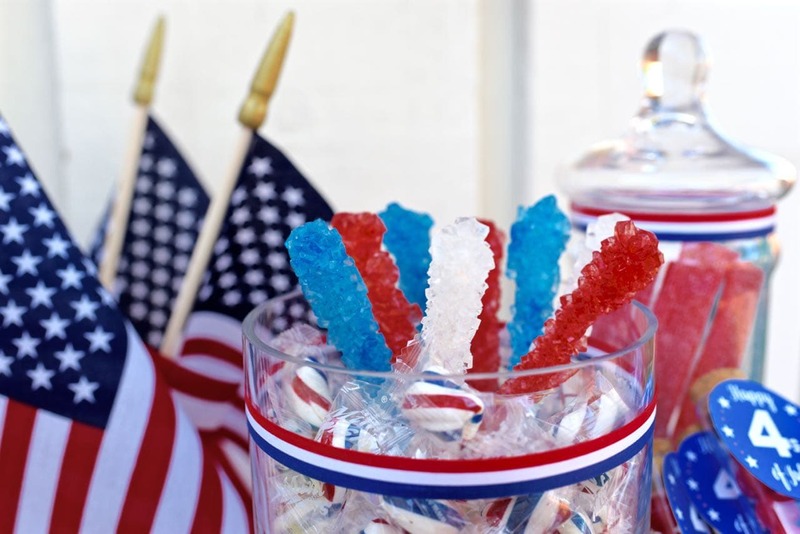 This Old Fashioned Fourth of July Party is sponsored by World Market as a member of their Trendsetter Tribe. All ideas and opinions are always 100% my own. Last year my family and I went to the most amazing old fashioned Fourth of July event, complete with a barbershop quartets, rides on an old steamer train, old fashioned games, patriotic crafts, apple pie, and more. It was amazing! 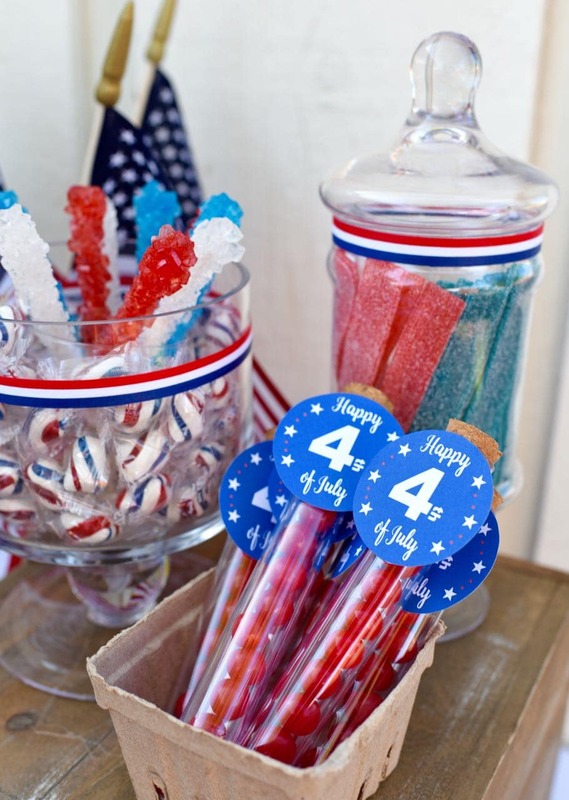 I wanted to create a fun, nostalgic party this year that’s reminiscent of an old fashioned Fourth of July of years past. 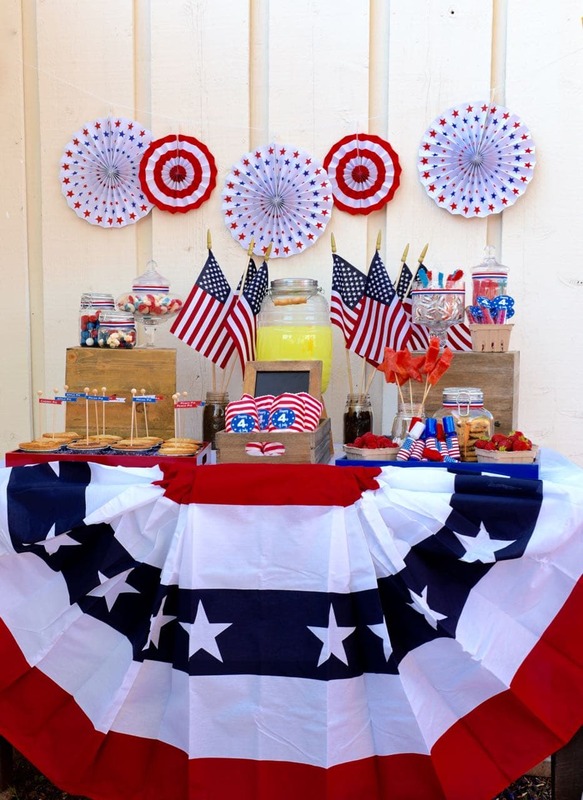 I covered my Fourth of July party table with a white tablecloth, then added a large Americana bunting to the front. I LOVE the added color and patriotic feeling that the bunting gives to the table, plus it has the vintage feel that I was going for. Since I wanted my party to have that vintage, old fashioned look, I used some amazing wooden crates that were already distressed perfectly and look like I’ve owned them for years, which is just the look I was going for! Stacking food on the upside down crates added height and interest to the table too. A smaller wood crate ran down the middle of the table. I used a mini easel chalkboard to hold up my red and white treat bags that I filled with caramel clusters popcorn. To dress up the bags a bit more, I created a free Happy Fourth of July printable that I cut out and taped to the front of the bag with double-sided tape. You can download the free Fourth of July printable HERE. Above the table I hung various red white and blue paper fans on a string, then placed lots of medium-sized American flags in two mason jars underneath the garland. On either side of the table were the red and blue lacquer trays from World Market that come in lots of different colors and are perfect for serving food at parties! 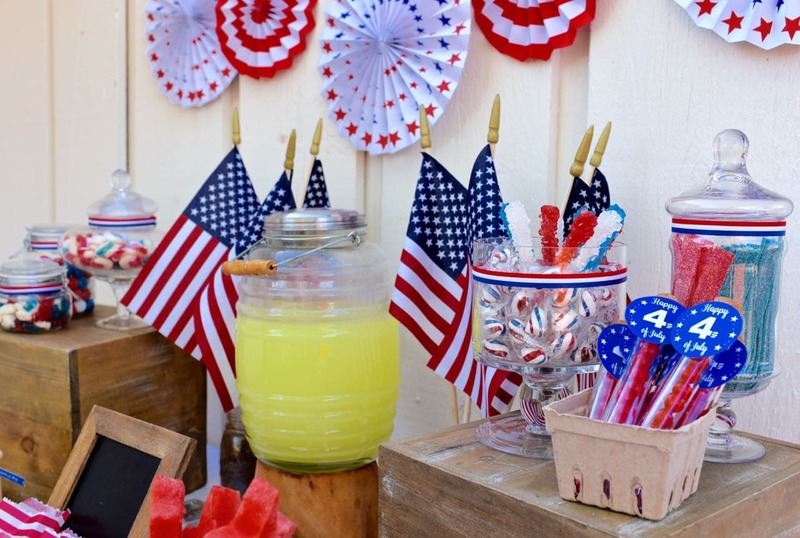 You just can’t have an old fashioned Fourth of July party without ice-cold lemonade, so I filled up a glass drink barrel with some. 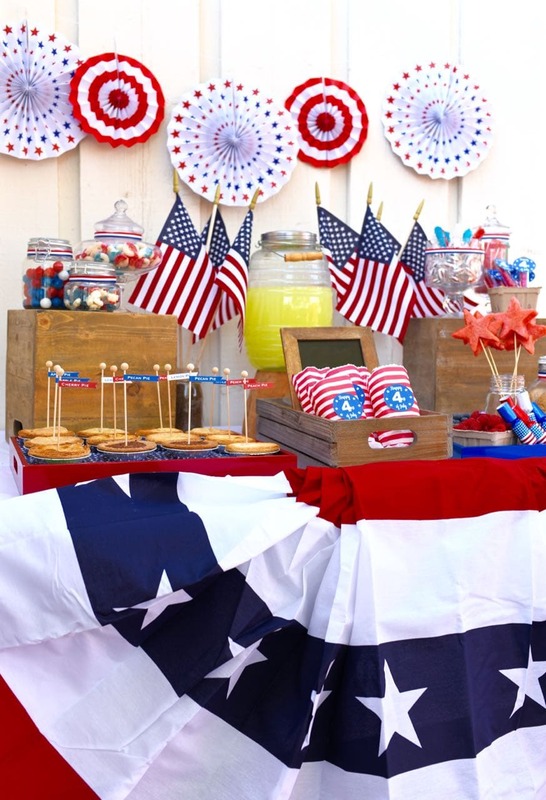 When I think of a vintage Fourth of July celebration, the first food that comes to mind is apple pie. I created a pie area on the party table that has an assortment of mini pies- apple pie, cherry pie, peach pie, lemon pie, and pecan pie. 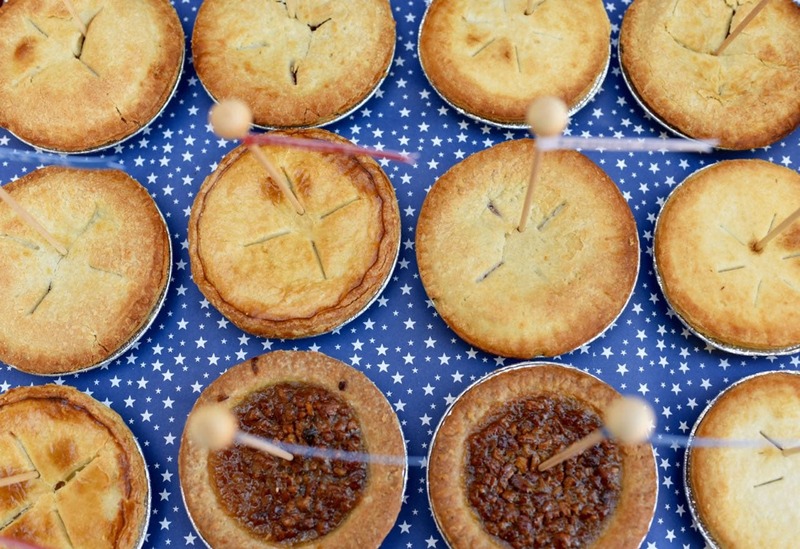 All the pies were laid out on patriotic scrapbook paper, then placed inside a red tray. 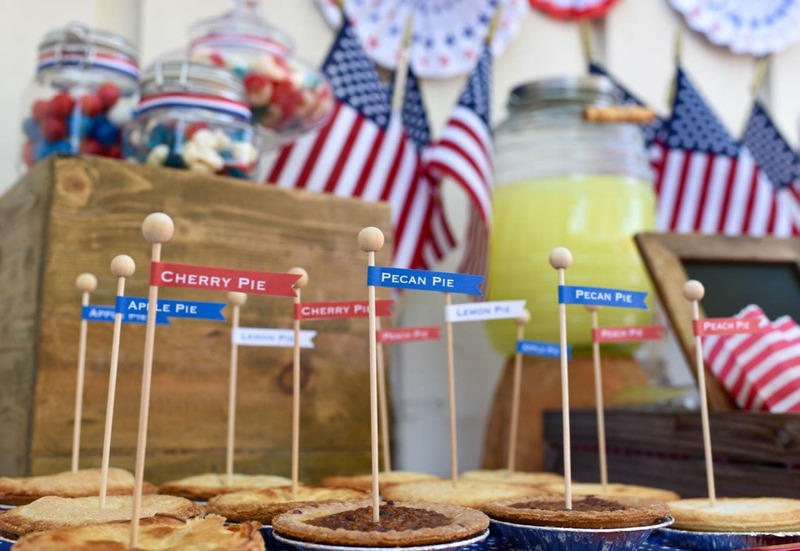 Inside each pie I placed a wooden rock candy stick (minus the rock candy), then glued on some adorable pie flag printables that I created in red, white, and blue. 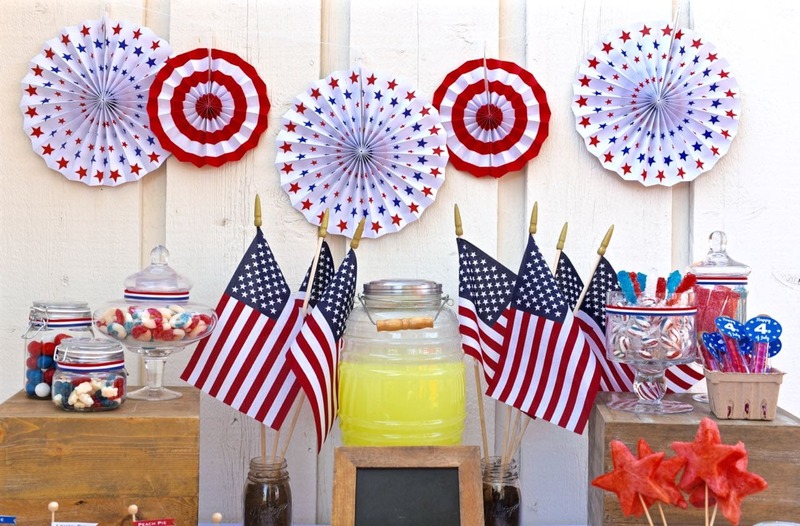 I love how they look like mini flags and add to the Americana look of the party! You can download the free mini pie flags HERE. 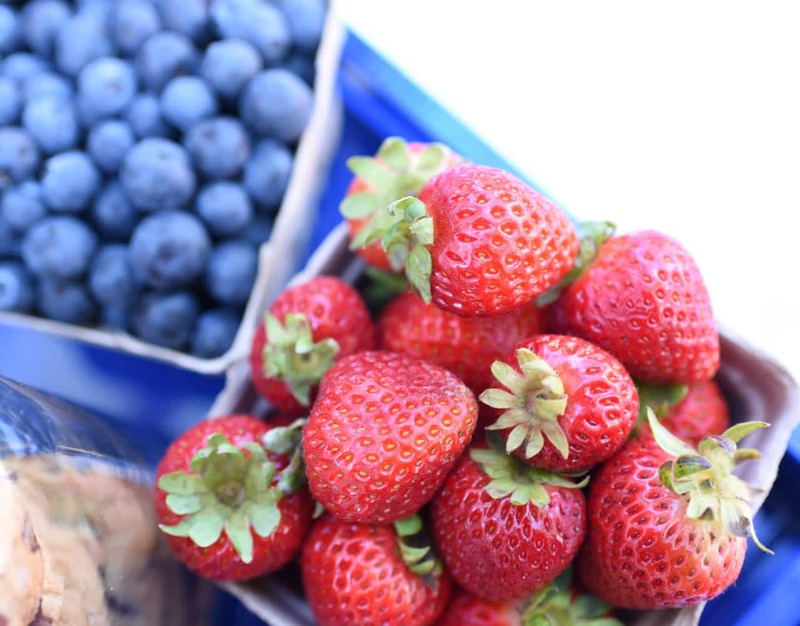 Kraft berry containers were overflowing with fresh strawberries, raspberries, and blueberries. 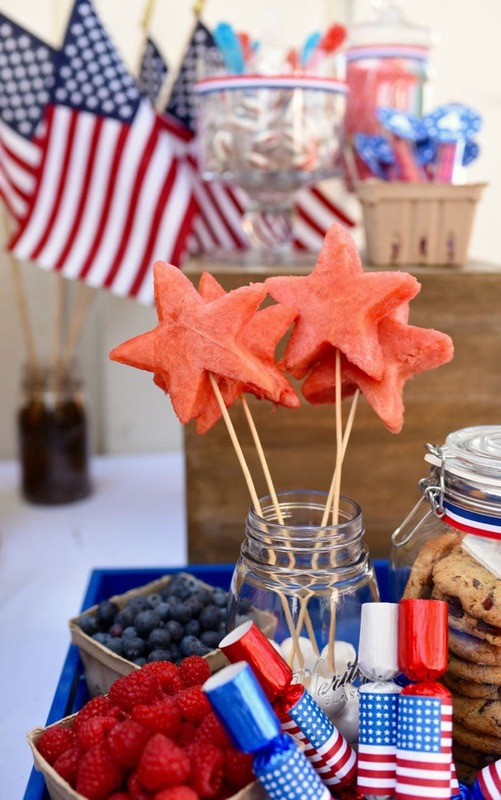 I used a star cookie cutter to cut out star-shaped watermelon pieces, then placed them on wooden skewer sticks inside a mason jar on a blue tray. A giant glass jar filled with chocolate cookies was my husband’s favorite. Can’t say that I blame him! 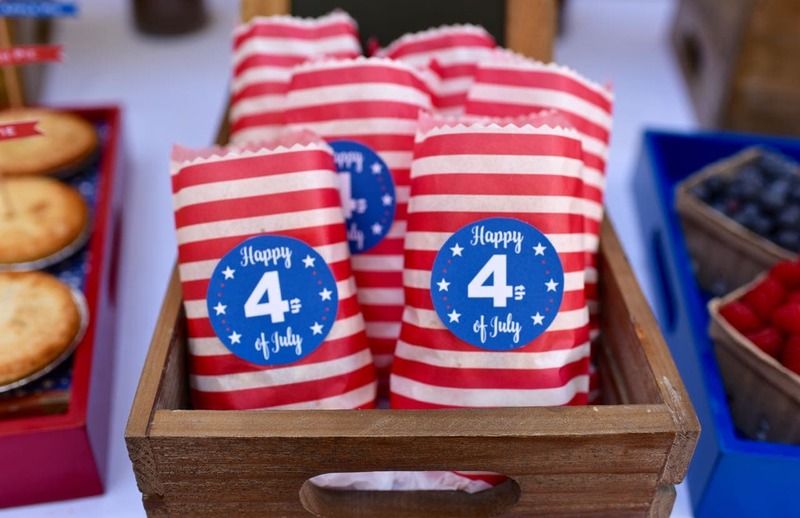 Mini patriotic crackers, modeled after the popular Victorian party favors, were scattered on the tray as well, just waiting for someone to pull on the ends to make a loud crack and release the Fourth of July trivia, jokes, and sticker that are inside. These are SO fun and are a great party favor for kids! 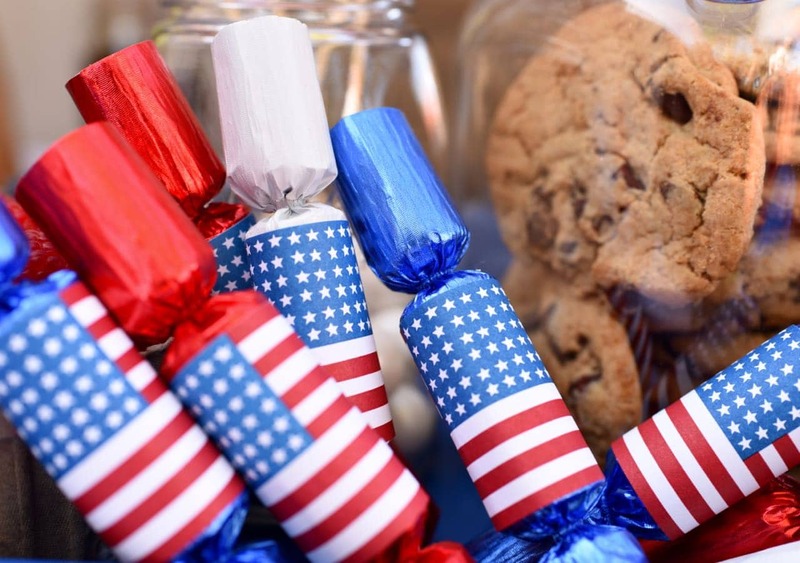 Penny candy is another food that comes to mind when I think of an old fashioned Fourth of July party celebration, so I stocked up on red, white, and blue candy at World Market. They had TONS to choose from! I set up two candy bar areas on top of each wood crate. To do this, I filled up glass apothecary jars and round glass jars with clamp lids in various sizes. 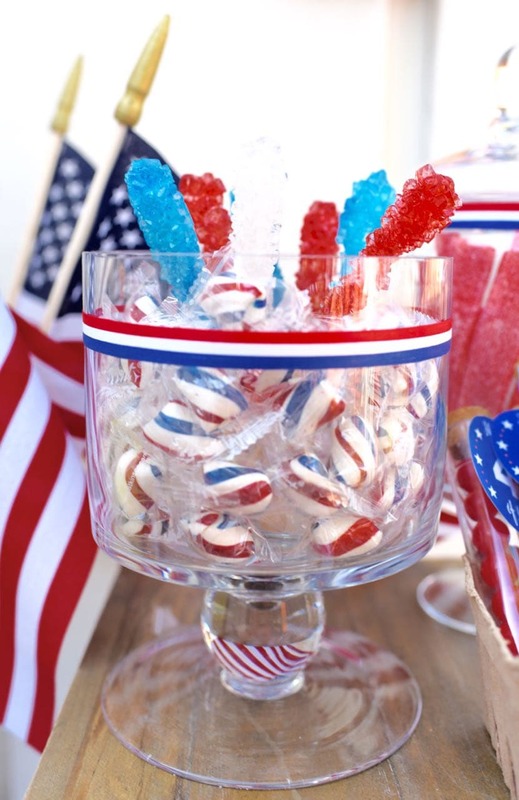 To add to the patriotic party theme, I taped a red, white, and blue striped ribbon around the rim of each jar. 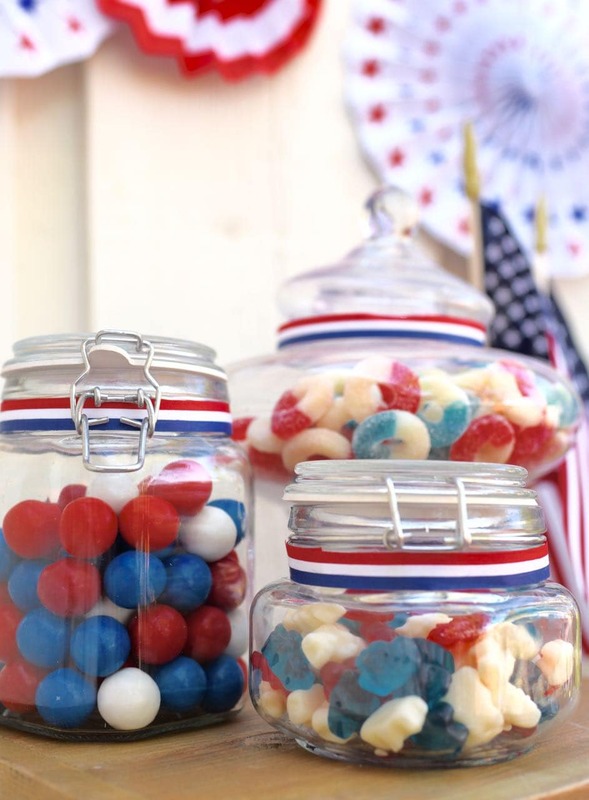 Our patriotic candy bar was filled with red, white, and blue gumballs, gummy bears, freedom gummy rings, peppermints, raspberry and strawberry candy belts, rock candy sticks, and candy tubes filled with cherry balls with the free printable Fourth of July tags at the top of them. Aren’t they fun?! Who knew you could buy all that candy in our nation’s colors! 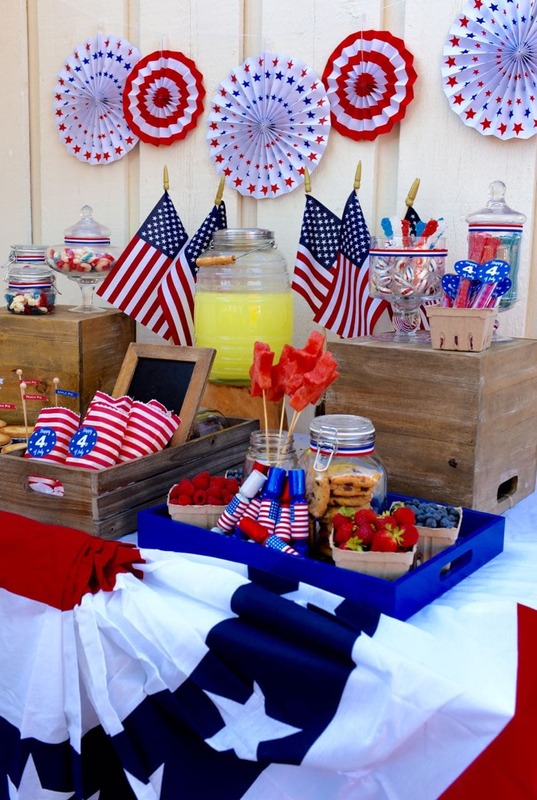 I hope you enjoyed our old fashioned Fourth of July party as much as I enjoyed putting it together! 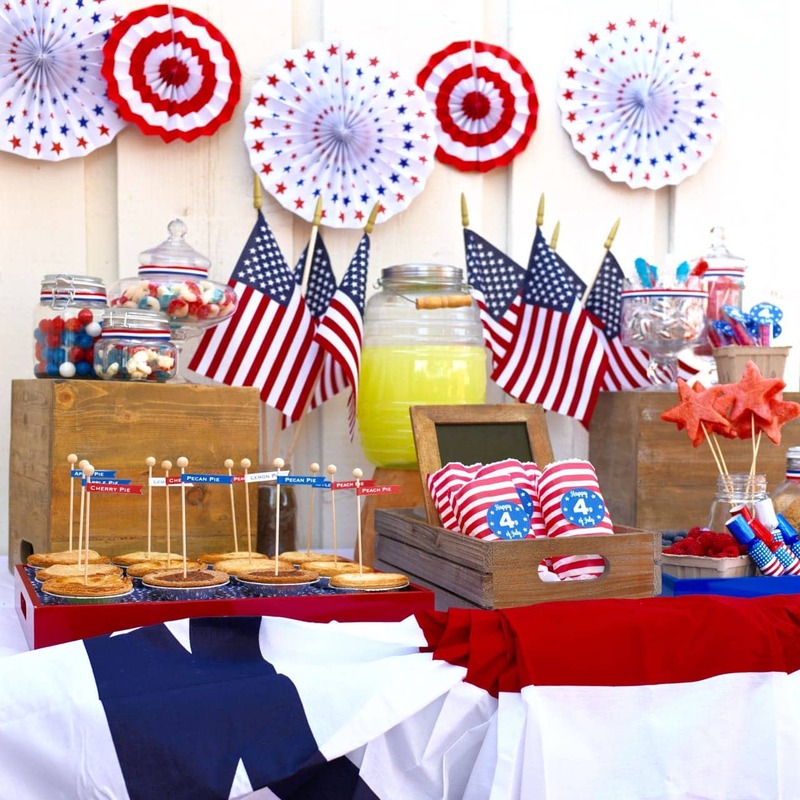 Surprise your family and friends with your own vintage Americana party and stock up on all the awesome Americana and entertaining supplies at World Market! You have created such a fun look for any age. I really like the pieces from World Market. I need to head over to mine soon. You totally should! I love how they are always adding new things so that the store is never the same. I’m always scoring new favorites at World Market! This looks like a super fun party! Great ideas! Thanks so much! We had an amazing time. The kids were pretty excited about all the red, white, and blue candy- especially the gumballs! What a gorgeous spread. 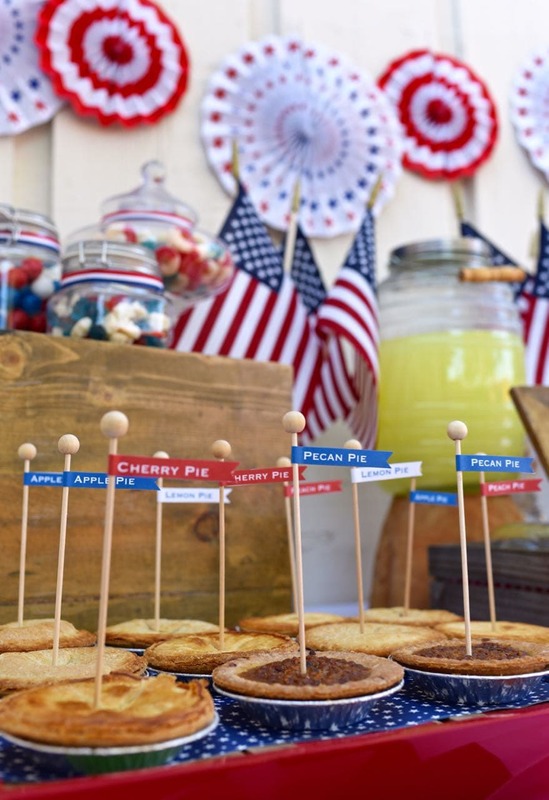 That drink barrel is adorable and those pies and pie flags… so sweet! You are the Hostess with the Mostess! Great ideas and Great looking display! Love it! Will definitely be tiring some of them, along with out usual Hot dogs, and Hamburgers with all the toppings! Happy Celebrating to you and your! Awww, you’re so sweet Paulette, thanks for your kind words!! So happy to hear you’ll be trying some of our ideas. Hope your Fourth was full of fun and delicious food!